In this society we built for ourselves, consumerism is king. From those churning micro-trades to selling everything from burgers to affordable clothes, there must be a buyer. Upon that simple truth stands my premise. Austerity seems to have worked for the 1%. The stock-market has doubled since 2008, as investment and commercial banks hardly know what the hell to do with their cash (apparently, anything except lend it to us). But it’s a chimera. 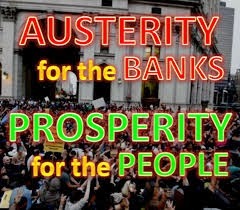 Never in the history of the world has austerity saved a crippled economy. Without a healthy ability to consume at the middle and lower income levels, we’re all at risk—every single struggling one of us—and as we stagger, the fabled 1% are about to fall in a spectacular fashion that will make 2008 look like the prelude it was. Put that in your pipe and smoke it on your way home from Davos. Soon that fabled and tiresome minority of the wealthy will own it all and, for me, it cannot possibly happen soon enough. Having swindled a formerly healthy and robust consumer majority into penury, there will simply be no one left to buy their products. In a worldwide frenzy for growth, none of them bothered to fertilize the crop. The once green pastures of consumerism are now withered and increasingly barren. McDonalds is already suffering a 15% decline in sales. Proctor and Gamble is set to shed over 100 brands as consumer demand evaporates. Wal-Mart, the world’s largest retailer, saw net income drop 21% in its last quarter. Reuters reports that U.S. retail sales recorded their largest decline in 11 months in December as demand fell almost across the board. You might ponder the fact that most retailers depend upon December to carry their sales year. The consumer bucket’s got a hole in it. January Sales now begin in November and no price is low enough. In the race to the bottom, retail and fast-foods are the winners. Yet the austerity engine keeps chugging onward in both America and Europe, as banks get their shirts ironed and the dirty laundry of job loss falls unevenly on a public that can no longer afford a Big Mac. Forty-five years after Ronald Reagan’s ‘trickle down’ theory, we’re witnessing a massive trickle up of poverty and job fragility, if not downright loss. Where, oh where, will all those Big Macs and Online Specials at Wal-Mart find buyers? Tooth paste? Yeah, we’ll probably all keep on buying tooth paste, but it will be generic and P&G will see a further brand shrinkage. Auto loans? Headed down the toilet along with student loans and massive credit-card default. Mortgages will follow, if lenders can even find the paperwork to forclose. Mario Draghi (some two years late and with tattered pockets) is about to invoke quantitative easing across the central banks of Europe and it will fail. The Federal Reserve led that fiscal insanity and now toys with interest rate hikes while the barn is burning--and that will fail as well. In Europe and America, we are simply out of consumers and running on empty, with the New York and London financial centers whistling past the graveyard. An economic tsunami is in the making, forecast by everyone from Warren Buffett to Goldman Sachs. Out of those inevitable ashes may come the massive investment in infrastructure and jobs that might have saved us all, rich as well as poor. This is not a wild-eyed scenario, nor is it a case of Monday-morning quarterbacking. It’s merely the comments of a man who has lived in eight decades, now watching in horror (and a certain amount of fascination) as the inevitable comes to pass. We abandoned consumers will be okay. A painful experience, no doubt, but we’ve been there before and know how to cope—we’re survivors. But I feel for those who know no other world than watching the numbers, because many of them will be destroyed and haven’t a clue what to do when there’s no mommy left to pick up after them. Some have never in their lifetimes put their shoulders to the wheel. These are the politicians, economists and power structures that cajoled us to the edge and then kicked us over. By this time next year, a substantial number of those corporate jets that whizzed into Davos will be for sale—and it will be a fire-sale. It could have been different. Certainly, it should have been.